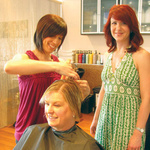 It's been a year now since Jaime Chevalier and her staff at Textures began a recycling program which puts chopped-off-locks to good use. When the community shuttle ceased operation last March, it had a wide-ranging affect on the community. 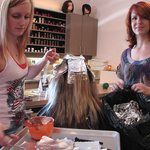 Jaime Chevalier and her staff at Textures sweep up a lot of hair from the floor of her Virgil salon, and are accustomed to putting it in plastic bags to be picked up curbside weekly.